Now it will ask for the reportcreation type of how you want to create the report. Once report file is added, you can see Field Explorer on the left side near server explorer. Expand Database Fields, under that you will be able to find Datatable that we have created earlier. Just expand it and drag one by one filed from Field Explorer to the rpt file under detail section. Now the report design part is over. Now we have to fetch the data from d dataset and then bind that to the report viewer. //set dataset to the report viewer. Now just save everything and run report. 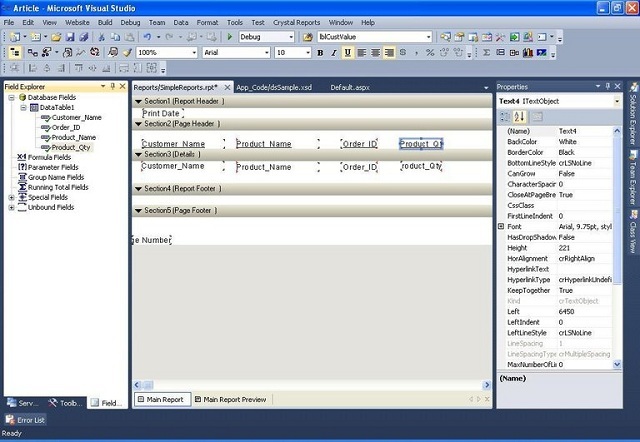 Open Visual Studio 2010 and create new project. Under Visual C# project templates, select Windows>>WPF Application. allowstransparency="True" - This property makes the Form transparent. background="Transparent" - This property specifies that the background color should be transparent. windowstyle="None" - This property removes the title bar and makes the form borderless. Basically removes all the system controls from the form. opacitymask="White" - This property makes the specified background color invisible from the form.